I’ve always had an image in my head of what the so-called white matter of the brain — the part most affected by MS— looks like. Boy, was I wrong! We’ve all seen the sliced images of our brains produced by those noisy MRI machines. They look somewhat like X-rays but show the soft tissue of the body rather than just the bones. I suppose that we’ve all also imagined what that stuff really looks like, and scientists at Cardiff University’s Brain Research Imaging Centre (CUBRIC) in Wales now have an answer for us. Their advanced MRI machine, coupled with highly specialized software, has produced computer images of the white matter — just the white matter — of healthy brains and those of people with MS.
A BBC health reporter had his scan done and reported on the process and its outcomes this week. There is a short video in the linked report along with several still shots from the scans that show the structure of the brain’s white matter. 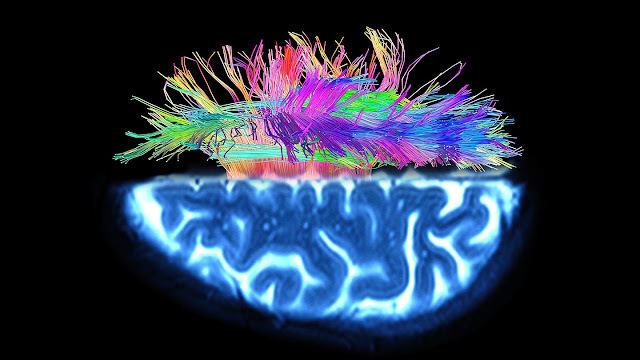 I guess I had imagined the “cables” and “wires” that make up the white matter to look more like some biological version of a mad doctor’s lab from a sci-fi film. I figured that the axons went from the inside of the brain outward and then down the spinal cord. The images from the CUBRIC MRI show the exact opposite — which, now that I think about it, makes perfect sense. The images can even show which direction the signals travel on those axons, which may help establish which functions of the body are affected by which lesions in the brain. The density of nerve fibers (so thin that it would take 50 of them to equal one human hair) is shown in exquisite detail. The feeling I got when looking at the images on my screen were not unlike those I felt when I attended an exhibition of preserved bodies in 2006. There was excitement, morbid curiosity, and a bit of sadness. After all, for a person whose brain fibers are compromised by multiple sclerosis, it’s a stark reminder of how intricate the brain’s systems are and how difficult the task of curing this disease is. Still, it’s another tool for researchers to use in searching for that cure. It’s a tool for our clinical teams to understand and explain the disease, what it’s doing, and how it is doing it. And although very few of us are likely to get this scan given the scarcity of these machines, the images help to explain to those of us with MS the part of us that is being attacked, and why we show symptoms the way we do.